An historic piece of Toronto's island airport is going to become a restaurant and event space at Hanlan's Point, the Toronto Port Authority has announced. Terminal A, which has been sitting in the saturated outfield of Billy Bishop airport since 2012, will be moved closer to the public side of the island and renovated with input from designers and TV personalities Sarah Richardson and Tommy Smythe. This morning, the TPA announced it had reached an "agreement in principle" to restore the building and open it up to the public, but it's unlikely to be a simple project. The protected three-storey structure, which once provided facilities for passenger and baggage handling, air traffic control and airport administration, has been abandoned and propped up on brick stilts for several years. Because of its heritage status, any alterations will have to be approved by the city. Specific plans, budgets, and timelines for the restoration, which is being financed by a group of Toronto businessman led by private pilot Alexander Younger, Richardson's husband, were not released. 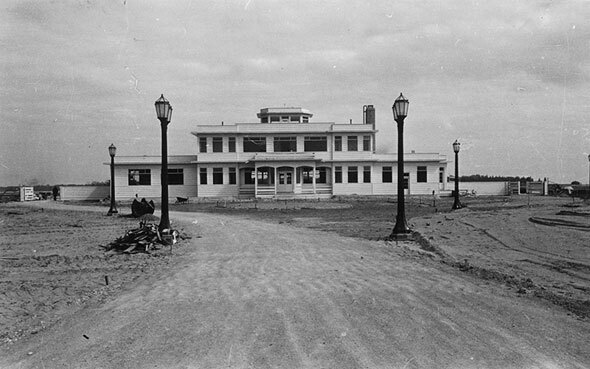 The white clapboard structure was the first passenger terminal at the Toronto Island airport when it opened in 1939. An almost exact copy of an early terminal building at Malton airport, now Pearson, it pulled double-duty as an air traffic control tower and processing centre for arriving and departing passengers. The terminal survived several expansions as the airport grew through its various incarnations as Port George VI Island Airport, a Royal Norwegian Air Force training camp during the second world war, and, more recently, a bustling hub for short-haul flights. The building was forced to make way for the airport side of the pedestrian tunnel, which is currently mired in a legal dispute, in 2011. It was decommissioned and shifted away from the centre of activity on top of a giant skid a year later. Questions surfaced over the building's future when the Toronto Port Authority, the airport operator, announced it was seeking a buyer who could preserve the building, one of the last of its kind in Canada, in a new location. What do you think of plan to give the old terminal a new lease on life?